Dispenser and receptacle doors provided with tumbler lock. Size: 12 3/4" x 26 1/2" x 4 1/4"
Model 0462 is recessed 4" with a 1/4" lip showing. Surface mounted model comes with a stainless steel collar. Will project 4 1/4" away from wall. • Elegant rounded corners and welded edges. • Constructed of stainless steel with a satin finish. • Dispenses 600 c-fold, 800 multi-fold, or 1100 single-fold paper towels. • Includes 9 gallon stainless steel waste receptacle with finger pull for easy removal. • Heavy duty piano hinge ensures smooth and long-lived operation. • For wall opening: 15-3/4" x 52-1/2" x 6-1/4". • Dispenses 350 c-fold or 475 multi-fold paper towels. • Includes 2 gallon stainless steel waste receptacle with finger pull for easy removal. • For wall opening: 12-3/4" x 26-1/2" x 4-1/4". • Proximity sensing hands free unit dispenses pre-set length of standard 8" paper towel roll. • Battery operated. Requires 4 D-size batteries. • Includes 17 gallon waste receptacle. • Recessed unit for wall opening: 15-3/4" x 54-1/2" x 10-1/4". • Surface mounted unit overall dimensions: 17-1/4" x 56" x 10-1/4". Size- 14 1/4" w x 28" h x 4 1/4" deep. • Elegant rounded edges and welded corners. • Concealed heavy duty piano hinge ensures smooth and long-lived operation. • For wall opening: 11-1/4" x 15-3/4" x 4-1/4". • Elegant styling with rounded edges and welded corners. 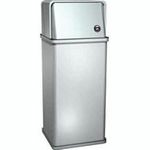 • Includes 12 gallon removable stainless steel waste container with finger grip for easy removal. • For wall opening: 15-3/4" x 38-1/2" x 6-1/4". • From the Omara Collection: refined accessories for refined restrooms. • Constructed of stainless steel with a bright or satin finish. • Includes 2 gallon reusable leak proof PVC pail. • Lid opens by pressing foot pedal. • Overall dimensions: 8-9/32" Diameter x 12-3/4". 7317 for bright finish or 7317-S for satin finish. Fabricated of 22 gauge type 304 stainless steel with satin finish. Top with self-closing doors. Vinyl wall bumpers top and bottom, rubber feet. Hooks for liners. Capacity: 14 gal. (54 L). Overall size: 13 x 30.5 x 12.25 inches(330 x 775 x 311 mm). 0812 (Not Shown) Same as 0810, except 19 gal. (72 L). Overall size: 13 x 38.5 x 12.25 inches (330 x 945 x 311 mm). Same as 0810, except without top; 14 gallon. Overall size: 13 x 22 x 12.25 inch (330 x 559 x 311 mm). 0813 (Not Shown) Same as 0811, except 19 gal. (72 L). Overall size: 13 x 30 x 12.25 inches (330 x 462 x 311 mm). Push door is self closing. Towels loaded by pushing through hinged dispensing flaps. Capacity: 1 package C-fold paper towels. Unit provided with loose waste receptacle to be placed directly below waste door on the vanity floor. 16 gauge stainless steel, rolled flange and exposed surfaces have #4 satin finish. Receptacle placed directly below chute. Size- 15 3/4" x 54 1/2" x 4 1/4". Suggested mounting height above floor is 16"